The stigma attached to cannabis consumers is finally starting to drift away at a quickening pace. As the cannabis industry finds its footing in post-legalization operations, employees are proving themselves by leading the cannabis movement with confidence and preparation. Years ago, it might have seemed like an oxymoron, but now there are high paying jobs for stoners in direct and associated cannabis careers. Many of the success stories that have come out of the newly legal industry are in the field of web development and entrepreneurship. Believe it or not, cannabis and technology go hand in hand, especially when it involves technology making the cannabis consumer’s experience easier. Using Weedmaps CEO Justin Hartfield as an example, it’s very possible to achieve high paying jobs for stoners. In an interview with Mashable.com back in 2014, the app creator who proclaimed to have smoked “almost every day” for the past fifteen years, expected over $30 million in revenue that year. In the years that have passed since the interview was released, websites and apps have become even more popular as states increasingly allow for adult cannabis sale and now, even recreational delivery in some areas. Leafly, which provides similar services to Weedmaps, as well as high quality written content and strain information, receives even more monthly traffic online that Weedmaps. With each passing year, more web developers are realizing the online world’s potential to create high paying jobs for stoners. When imagining high paying jobs for stoners, it’s likely that cannabis growing comes to mind. While marijuana cultivation jobs do carry the potential for significant payouts, the growing sector of the cannabiz is steeped in heresay from years of grey market operations. Since legal grow operations now must follow government regulations, undergoing significant monitoring, it’s still unclear exactly how avergae growers’ wages will change as a reflection of legalization. In any case, there is some anecdotal data strongly suggesting that master growers and grow operation leaders can make six figure salaries, plus bonuses. Master growers may be stoners, but they are dedicated ones at that. The success of a crop rests largely on the grower’s conscience and reputation, so master growers must have significant field experience. Many growers also have degrees in horticulture, or have led non-cannabis grow operations in the past. In addition to being good cultivators, larger operations require master growers to successfully inspire and lead a team in bolstering and managing the crop. Many top-tier growers are also great businesspeople who know the ins and outs of the industry and keep their finger on the pulse of changing legislation. Like any job in the industry, cultivators must be truly passionate about cannabis. The crop can’t be treated like any old plant and must be given the attention and care that it individually requires in order to thrive and be sought after by cannabis distributors. Another way cannabis professionals are acquiring high paying jobs for stoners is through business consultation. Cannabis consulting jobs are experiencing incredible demand, especially as more cannabusinesses open up and require legal or business counsel. Consulting covers a variety of basis when it comes to the cannabis industry. Lawyers with cannabis industry experience are capitalizing on the convoluted legislature surrounding establishing a business venture. Consultants help potential business owners sidestep the swamp of reading and understanding all the rules and regulations associated with business establishment. Consultants are experts in putting information in lay terms and even managing aspects of the business’ operations. Some cannabis-specific consulting firms are offering accountant services for cannabis dispensaries, since distribution is done mostly in cash sales and has a complicated tax structure. Grow operations also benefit from consultants in order to make sure they are operating correctly with compliance before starting a project that is in violation of state or local regulations. High paying jobs for stoners that definitely require being sober at work is concentrate creation. Concentrates are the sticky, waxy, oily, crumbly, sugary looking substances that contain all of the essential compounds like THC, CBD and terpenes, but little to none of the plant matter. Cannabis concentrates contain significantly higher levels of THC than flower. While you’ll seldom find buds with more than 30% THC, you can easily find concentrates with 70% of the cannabinoid. Concentrates can be used alone for dabbing, or can be infused into edibles. The process of converting raw cannabis plant matter into concentrates requires a cannabis extraction technician. This specialized job tasks employees with using industrial strength solvents like butane and CO2 to strip the plant matter away from the compounds and end up with a more “pure” product. Cannabis extraction technicians are compensated well, and for good reason. These individuals must have good credentials in order to secure a job, including a B.S. in Chemistry, or even more advanced degrees. Cannabis extraction takes place in a laboratory environment and involves dangerous elements like fire. Extraction technicians have to be very careful and organized in their work, and of course must make sure they are following compliance measures. Salaries for this job average around $100,000 and higher for major operations. While contributing to cannabis publications as a strain reviewer is a dream job for many, the job rarely pays full-time wages. On the publishing end, however, there are opportunities for entrepreneurs to land high paying jobs for stoners in magazines and newspapers. Publications like The Cannabist, High Times and Culture Magazine use online and print media to enhance and disseminate enjoyable, informative content. While not all publishers are rolling in dough, the publications that have fought through the undulating hurdles or legalization and stigma erasure are reaping the rewards of investing into an unsure business that happened to break. Publishers make money through traffic and advertisements, subscriptions, events and product sales in some cases. Magazines give publishers a platform to diversify their income and bring in revenue through a variety of forums. If the demand for cannabis is surging, so is paraphernalia manufacturing! After all, many cannabis consumers still like to smoke or vape flower and concentrates. Glass blowers and merchants have always been important to the industry. Real stoners recognize that a piece is more than just an object, it is your partner in crime–the thing that facilitates cannabis use. Glass blowers frequently travel to music, arts and cannabis festivals, as well as sell their wares online. While there is a market for less expensive pieces, some glass merchants make high sales off of pricy singular items. Glass blowers who are interested in making elaborate, artistic pipes and bongs make their money this way, with less overall sales, but higher payouts per piece. Surprisingly, paraphernalia creation is a high paying jobs for stoners. Vaporizer and dab rig creators are jumping on the widespread interest in concentrates. Vapes of all shapes are gaining popularity due to their discrete, concealable build and lack of smoke emissions. Vapes are also convenient and durable enough to travel with or carry around inside of a backpack or handbag. This one might require a little explaining. Bud trimming isn’t always associated with high paying jobs for stoners; however, it is a well-paying job for stoners who aren’t looking for high intensity jobs with above average levels of responsibility. Trimming is a position that allows for individuals to work by themselves, snipping away excess plant matter from marijuana flower. Although entry level trimmers are paid between twelve and fifteen dollars per hour, some trimmers make closer to twenty per hour if they are experienced and the employer pays by weight. While it can be debated whether twenty per hour for trimming is a high paying job for stoners, it definitely compensates better than most entry-level or manufacturing positions in other industries. Additionally, trimmers are given the opportunity to listen to music, be around cannabis and not have to interact with customers. Trimmers usually are allowed to take home pot for themselves, which is an added bonus. For bud trimmers who are interested in advancing into a more involved career in cultivation, trimming can be an excellent avenue for making connections in the business and learning the tricks of the trade. 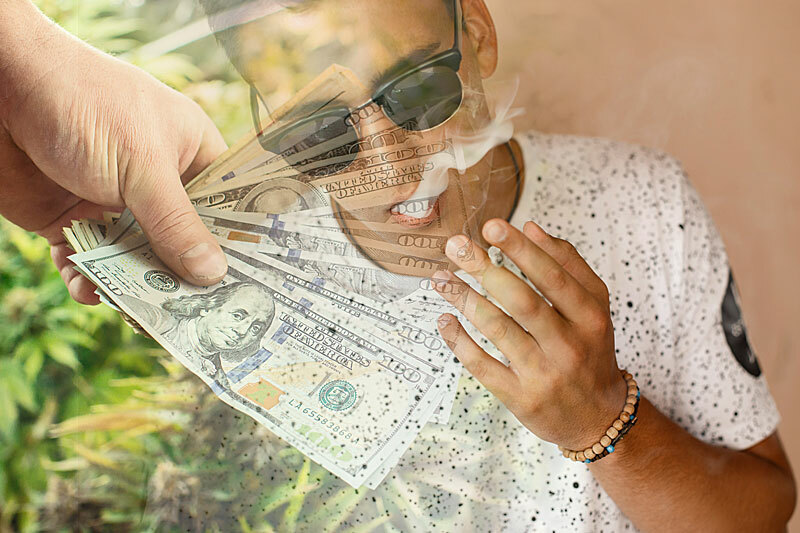 High Paying Jobs for Stoners: More Where That Came From! If there’s one thing to take away from the selection of high paying jobs for stoners above, it’s that being a “stoner” isn’t what history has taught us to believe. Cannabis users can be just as passionate, hard-working and intelligent as non users; in fact, some studies suggest cannabis makes people smarter. In order to find the right job for you, consider the atmosphere and environment each potential job would involve. There are both marijuana jobs for introverts and marijuana jobs for extroverts–the cannabusiness is big enough to support diverse voices and life experiences with the careers it has to offer.